The I-Team uncovered more than 60 reports of fires in Kia Sorentos and Optimas since 2011. Senator Bill Nelson caught one of our first reports in April. 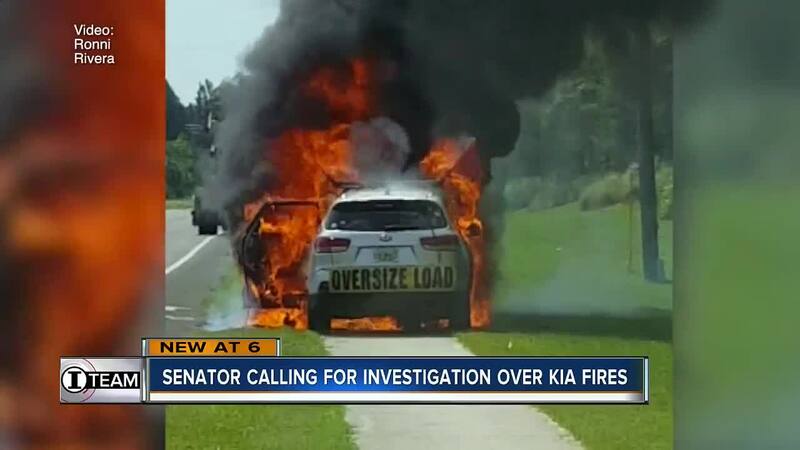 Then last month the ranking member of the Senate Commerce Committee which oversees the auto industry watched the footage of another Kia going up in flames near Orlando. Senator Nelson has formally requested the National Highway Traffic Safety Administration detail what steps it's taking to address the fires. The agency told us it is reviewing the issue and will take appropriate action to protect the American Public. Last week Duane Silva and his 10-year-old son were in their 2014 Kia Forte when the engine erupted into flames. Silva is the sixth Kia owner we've interviewed who claims the manufacturer had no interest in examining the car for a cause. The center for auto safety last week also formally requested NHTSA investigate what it calls an alarming number of fires.